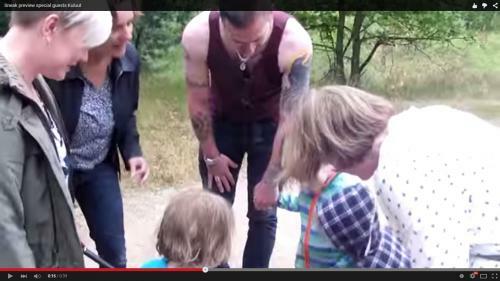 LOCKLINEA documentary about the family of Marc and Suzanne Driessen. Living with a child with a syndrome, but most of all: the happiness of a syndrome. In 2012 Coen, 4 years old now, was diagnosed with the Bohring Opitz Syndrome: a rare genetic disorder with which only 40 children worldwide are known with. The word ‘syndrome’ is often negatively associated. Therefore it’s even more extraordinary that we are going to highlight the positivity of a syndrome in this film. In this documentary I am going to explore how this special family gets their happiness and power. In a way I am going to have conversations with this family while doing ordinary activities. For example: we are going to ride our bikes through the beautiful scenery of Limburg to the Maas. Coen has a special bicycle trailer and he is enjoying the sun shining through the plastic cover. We will cross the river using the ferry and will have a seat at a picnic bench on the other side. I will be on camera as well, in order to create the vision of a real conversation and therefore create the delusion that the camera’s aren’t there. I will ask personal, intimate and profound questions, but we will also discuss light and beautiful subjects like beautiful family memories. Beautiful images are an important factor in this documentary. Happiness can be found in the smallest things, therefore it is important to capture this in images as well. An example is a butterfly fluttering away. This message will even be increased by capturing the contrast as well: filming an EEG for example. However, the focus will be on happiness, power and positivity and by doing this, we will touch our audience. Even though the conversations won’t be fully worked out on beforehand (to keep it spontaneous), there will be a clear thread recognizable which will link the images. Besides this, there is a special trip to Los Angeles planned. There we will have a meeting with Dr. John Graham, one of the few doctors who is actively involved in research on the syndrome. It is a wish of the family to meet him and maybe get more clarity. Also during this trip, the delusion will be created that the camera’s aren’t there. This meeting won’t be the only thing that we will film during this trip, also the trip itself and making new memories will be filmed. There is even an option to arrange a meeting with other families with a child with the same syndrome. In December 2003, Suzanne and Marc, both active and happy people, got their first child: Ties, a healthy and also happy, little boy. Four years ago they had another son: Coen. Unfortunately not healthy, but nonetheless very happy! The family wasn’t put out by the many hospital visits, lack of clarity, uncertainty and pain. The more or less continued their life as they had planned it. Suzanne has an administrative occupation on a high school, Marc has a successful job at Ordina and Ties is going to highschool soon. And what about Coen? Coen enjoys life the fullest and drags everybody along with him! Besides being a documentary maker and director (International Media & Entertainment Management, NHTV), I am also the cousin of the family. I have a very strong connection with all four of them and that is also the reason why they want to open up to me in front of the camera and therefore share their happiness and power with the world. I am a loving person and I’m open for everything. I like to think out of the box and explore the boundaries. When people tell me that I can’t do something, I will do everything to prove them wrong. I am not afraid to show my emotions, I’m very spontaneous and this makes it real. The strong connection that I have with the family will therefore be expressed on camera as well. This is another aspect which makes this documentary extraordinary and special. Al eerder kondigde ik aan dat ik een weekend mijn familie zou bezoeken en dat daar dan ook bijzondere gasten zouden komen. In een eerdere update heb ik al verteld over dit fijne en mooie weekend. Dit is het moment waarop jullie allemaal hebben gewacht... Ik interviewde Annabel Bromley. Een schat van een vrouw en moeder van Jackson. Helaas hebben wij Jackson nooit mogen ontmoeten. Hij overleed vorig jaar op 7 jarige leeftijd door Bohring Opitz Syndroom. Toch heb ik het gevoel dat ik Jackson een beetje ken na dit bijzondere weekend. Ik sprak met Annabel over hem, over Coen, over het Bohring Opitz Syndroom en over deze documentaire. Bekijk de video hier! Earlier I made the big announcement that I was visiting my family over the weekend and that there would be special guests. In an earlier update I told you about this nice and beautiful weekend. This is the moment you've been waiting for... I interviewed Annabel Bromley. A lovely woman and mother of Jackson. Unfortunately we never got to meet Jackson. 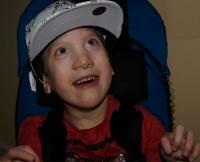 He passed away last year at the age of 7 because of Bohring Opitz Syndrome. However, I have the feeling that, after this special weekend, I got to know Jackson a little bit. I spoke to Annabel about him, about Coen, about the Bohring Opitz Syndrome and about this documentary. Watch the video here! Zoals ik vorige week al aangaf zou het weekend een bijzonder weekend worden, en dat is het ook geweest! bezoek geweest. Maar ik was niet de enige die bij hen op bezoek zou komen. Ik heb dit weekend hele speciale mensen mogen ontmoeten. Annabel en Ross kwamen helemaal uit Schotland om mijn oom en tante te kunnen bezoeken. Zij hadden ook een kindje met het Bohring Opitz Syndroom: Jackson. Helaas is Jackson vorig jaar op 7 jarige leeftijd overleden. was het erg fijn en ook emotioneel om Coen weer te zien. Zij herkennen heel veel van Jackson in Coen en het was dan ook een erg mooi moment om te zien hoe Annabel mijn neefje vasthield en knuffelde. Ik heb met Annabel gesproken over Jackson en over het Bohring Opitz Syndroom en heb dit gefilmd. 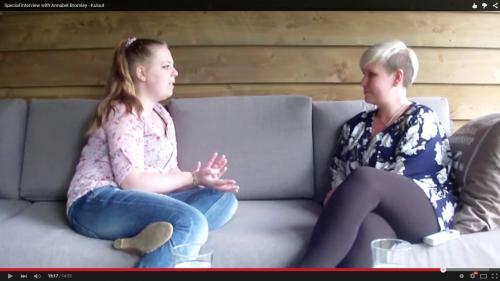 Volgende week zal dit interview online geplaatst worden! Op zondag kwam er meer bezoek bij. Sünne en haar prachtige kinderen uit Haarlem sloten zich aan bij een wandeling in het park. Sünne en haar man Rob hebben hun oudste zoontje Okke verloren aan het Bohring Opitz Syndroom. Sünne vertelt daar kort iets over en deelt ook haar ultieme geluksmoment, deze video zal binnenkort ook online komen. Omdat er maar zo weinig kinderen bekend zijn met dit syndroom, is het des te bijzonder dat er hier drie gezinnen samen waren dit weekend. In deze sneak preview (klik hier) kunnen jullie alvast een blik werpen op deze prachtige mensen. Last week, I mentioned that this weekend would be a very special weekend, and it was! I visited my family and I also spent time with my uncle and aunt, Marc and Suzanne, and cousins Ties and Coen. However, I wasn't the only guest. This weekend I had the opportunity to meet some beautiful people. Annabel and Ross came all the way from Scotland to visit my uncle and aunt. They had a son with the Bohring Opitz Syndrome as well: Jackson. Unfortunately, Jackson passed away last year at the age of 7. Therefore it was very special to be with these people and especially for Annabel and Ross it was very nice and emotional to see Coen. They recognize a lot from Jackson in Coen and it was a very beautiful moment to see Annabel holding and cuddling my little guy. I had a little chat with Annabel about Jackson and about the Bohring Opitz Syndrome and filmed this. Next week this interview will be posted online! On Sunday we had even more visitors. Sünne and her gorgeous kids came from Haarlem to meet us and have a walk through the park. Sünne and her husband Rob lost their oldest son Okke to the Bohring Opitz Syndrome. Sünne en haar man Rob hebben hun oudste zoontje Okke verloren aan het Bohring Opitz Syndroom. Sünne shares a little bit of her story with us and tells her moment of happiness, this video will be posted soon. Because there are only so little children known with this syndrome, it's even more special that these three families were together. In this sneak preview (click here) you can already meet these lovely people. De crew stelt zich voor! Maak kennis met Marvin en Joardy van Subtiel! Marvin en Joardy from Subtiel are introducing themselves and share their moment of happiness. Ik heb al een aantal keer de vraag gekregen waar de naam "Kuluut" vandaan komt en ik vond deze zonnige dag een prima moment om deze mooie herinnering op te halen en met jullie te delen. Zoals jullie weten gaat deze film de positieve kanten belichten en de focus ligt dan ook op kracht en geluk. In aantocht naar deze documentaire en tijdens het filmen van de eerste beelden ben ik er achter gekomen dat familie een groot deel uitmaakt van het geluk dat mijn oom, tante en neefjes hebben. Marc is een broer van mijn vader en mijn peetoom. We hebben een erg grote familie en het mooie van deze familie is dat ze elkaar altijd bij staan in mooie en minder mooie tijden. 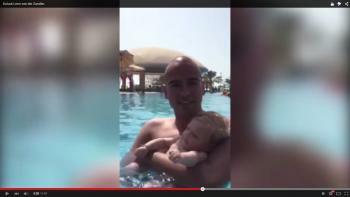 Helaas hebben wij vorig jaar een erg belangrijk persoon in deze familie moeten verliezen: opa. Het hoofd van de familie. Gek op zijn kinderen, maar nog veel gekker op zijn kleinkinderen. Zo ook dus op Coen. Wanneer opa op bezoek ging bij ome Marc en tante Suzanne, liep hij vrijwel direct door naar de woonkamer waar Coentje op de grond lag. Hoe oud hij op een gegeven moment ook was, opa ging bij Coen languit op de grond liggen. 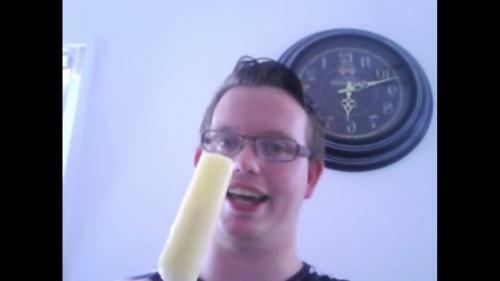 Coen vond dit geweldig en wist het direct wanneer opa kwam. "Kuluut!" riep opa dan, waarop Coentje begon te lachen en met zijn handjes begon te zwaaien. Kuluut was dus een bijnaam die mijn opa aan Coen gaf en met deze film willen we dat in ere houden. Multiple times the question what the name "Kuluut" means was asked to me. Today the sun is shining here in The Netherlands, and I think this is the perfect moment to explain this and share a beautiful memory with you. As you already know, this film is about the positive things and the focus is on strength and happiness. In the pre-production phase of this documentary and during the production of the first footage, I've came to the conclusion that family is an important part of the strength and happiness of my uncle, aunt and cousins. Marc is my father's brother and my god father. We have a big family and the best part of this, is that everybody is always there for each other, during good times and less good times. 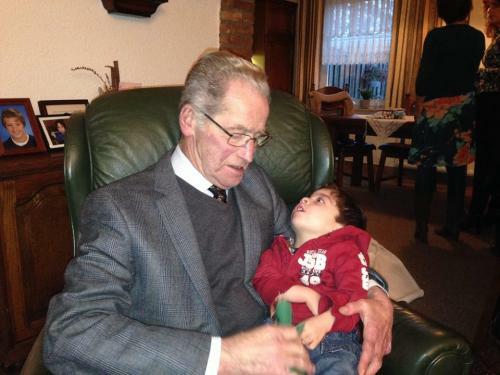 Unfortunately, last year, we lost a very important person in this family: opa (grandpa). The head of the family. Crazy about his kids and even crazier about his grandkids. Also about Coen. Whenever opa visited my aunt and uncle, he walked almost directly towards the living room where little Coen was lying on the ground. No mather how old he got in the end, he always laid himself down next to Coen. Coen loved this and he knew immediately when opa was around. "Kuluut!" opa would yell, and Coen would start laughing and waving his little hands. Kuluut was a nickname opa gave to Coen and with this film, we want to keep this in honour. We vroegen NHTV IMEM lecturers naar hun ultieme geluksmoment. We asked NHTV IMEM lecturers what their moment of happiness is. We vroegen cabaretier Leon van der Zanden naar zijn geluksmoment. thank you so much for believing in us and donating, we are almost on €2.300,-! With only 29 days left and still almost €8000,- to raise, it's getting really exciting. Please help us out and ask everybody you know to donate! Even if it is just a small amount, it would be such a pity if we won't make it and all of the money goes back to the sponsors. Heel erg bedankt voor het geloof in ons en voor het sponsoren, we zitten al bijna op €2.300,-! 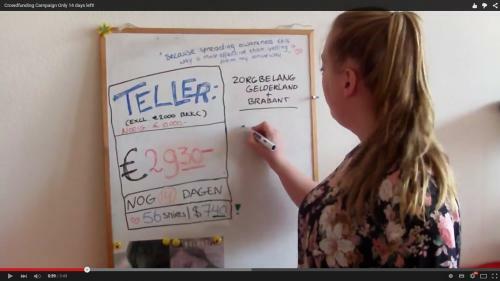 Met nog maar 29 dagen te gaan en nog bijna €8000,- op te halen, is het erg spannend. Daarom wil ik ook vragen of jullie vrienden en familie willen vragen te doneren. Alle beetjes helpen, het zou zonde zijn als we het niet zouden halen en al het gedoneerde geld weer terug zou gaan naar de sponsors! Thanks! We are very happy with you! You will get a personal digital thank you note! Thanks! This makes us so happy! You will get a personal thank you note and a digital link to the final film when it's finished! Spread the word and spread the love! Thank you, this means so much! Of course you will get a personal digital thank you note with a unique picture and the link to the film when it's finished. Wow man, you made the credits! We will mention your name in the credits at the end of the film. You will also get an online link to the film when it's ready, and of course a personal digital thank you note, including a unique picture! Wow! Thanks man! You deserve a special BOS ribbon! This ribbon is designed by mothers of children with the BOS syndrome and is our symbol of love, strength, happiness and gratefulness! Besides this, your name will be in the credits and of course you will get a digital personal thank you note including a unique picture and you'll get a link to the film when it's finished. How cool is that? Wow! Thanks man! You will get a signed postcard with a personal note of the director. You also deserve the special BOS ribbon, your name will be in the credits and you will get an online link to the film. Wow, wow, wow! Thanks, you're amazing! You will get a thank you from the director via a personal video message. Besides that, you will also get a signed postcard from the director, the online link, you will be in the credits in the 'Thanks to..." area and of course we will send you the special BOS ribbon. On top of that, we will make a short film of inspiring people telling about their idea of happiness and we are going to show this at the official première... and you are one of these inspirational persons! Is this a dream? Quick, wake me up! No, it's real! You're the best! This is what you get: Personal video message from the director AND the family, a signed DVD, an online link to the film, the BOS ribbon, we will mention you on our social media, you will be a star in the special film we will show at the première event, you (or your company logo) will be on the credits with the title of AMBASSADOR and on top of that, you will get two VIP tickets to the première! And if you can't be there: I'll give you a call and sing you an improvisation thank you song! If you have a great idea yourself how we can show our gratitude.. don't hesitate and message us! Are you kidding me? You are our hero! For real! Thank you so much! <3 Of course we will mention you on our social media, you will get an online link, you will get a personal video message from the director and the family, you will get a leading role in the short film about inspirational people we will show on the première event, you will get a signed DVD and the BOS ribbon. You will also get a special Ambassador title in the credits AND your company logo will be in there! Besides this, you will get FOUR VIP tickets to the première AND a link to a private channel with footage of the film that didn't make the final cut! If you have a great idea yourself how we can show our gratitude.. don't hesitate and message us! 110 supporters have contributed to this project!